"I think it's inarguable that Mom, Dad, and Lowell were more shattered by Fern's departure than I was. I fared better simply by virtue of being too young to quite take it in. And yet there were ways in which I as the one who carried the damage. For Mom, Dad, and Lowell, Fern had arrived in the middle of the story. They'd gotten to be themselves first, so they had a self to go back to. For me, Fern was the beginning. I was just over a month old when she arrived in my life (and she just shy of the months). Whoever I was before is no on I ever got to know." The first person voice that Fowler uses to write this book, completely from the perspective of Rosemary, is at times unreliable and foggy at best and often takes on a stoic quality while relaying events in an odd order. At the end of the short prologue Rosemary informs us that she has decided to, "start in the middle." I found this voice and jumbling of events tedious at first and had a hard time getting into the story, but by the middle and through the end I was very happy that I kept with it and finished the book. The unreliable, foggy memories, told via bitterness or stoicism become more understandable and relatable as the narrative continues, although it was a bit alienating at the beginning. By the end everything ties up beautifully and I appreciated why Fowler decided to write it the way she did. The Cooke family is given the label of 'disfunctional family' fairly early on, at one point Rosemary day dreams of being a 'happy' family and she says, "I see how, in a family like mine, love doesn't have to be earned and it can't be lost. Just for a moment, I see us that way; I see us all. Restored and repaired. Reunited. Refulgent." So, don't be fooled by anything you've heard or what you see on the cover, although this novel has primates in it, it is not a story filled with fun and games or carefree time spent playing in trees with your local zoo's chimpanzee. On the contrary, it will definitely make you take a closer look at the animals when you visit the zoo again and wonder if they are happy, wonder about their individual lives as well. This book delves deep into family dynamics, how the first five years of one's life shape the rest of it, the ways in which we are all animals and some animals are closer to human than many humans are. 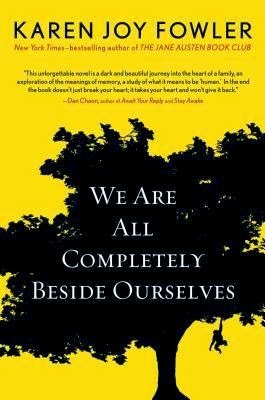 Reading this book made me genuinely sad that I don't have siblings, but also a little relieved that I don't feel that connection and responsibility to even more individuals than I already have in my life. Overall I truly enjoyed this book and imagine myself reading it again in the future, but will again have to be patient through the voice at times and endure through some aspects that are slow or feel distant. Often I felt beside the story, beside myself, instead of inside of it and I think that was a good choice by Fowler, it was just different from most styles I'm used to reading and I was happy that it made sense by the end. "What if I said science could be a sort of religion for some people?" "I'd disagree." Dr. Sosa sat back happily. "When science become religion, it stops being science." Rosemary thinks this after being confronted by her parents about bad grades and how they feel like they are wasting money on her education: "I was reading great books and thinking new thoughts. Surely that was the point of a college education. I said that the problem with people (as if there were only one) is how they think everything can be measured in dollars and cents." Although this book is anything but fun and games, it is still very hot outside and I think a fun banana drink will help cool you off while you read. It will also make the book feel less heavy and hopefully help to accentuate the best parts of the story, which do include an interesting primate. Banana drink can easily be made with about 1/4 C. of milk, 2 bananas (the riper the better), your desired amount of ice, and a hint of vanilla blended together well.